Another beautiful October day testing bird dogs. 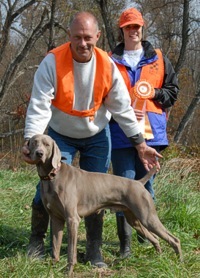 The DC Weim club held its annual Fall Hunt Test at the York Pointer and Setter club in Wellsville, Pennsylvania. Between tasks at the senior/master field, we got in a few shots. 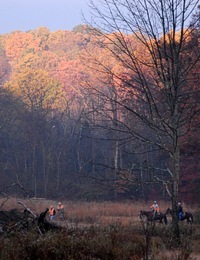 The rising sun hits the top of the trees as the first Junior Hunter brace makes its way through their back course. 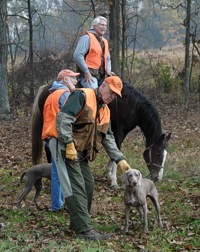 At over 200 yards, you can really appreciate why hunters wear blaze orange. An apprentice judge and her mount have a moment's peace waiting for the first brace of dogs to come to the line. Rosie and her handler wait for their bracemate to approach the senior breakaway. Rosie is joined by her bracemate, Gala, and the team shares a morning jest with one of their judges. Getting more excited by the moment, Rosie gets to meet one of the test's marshals (horseback, on the left, with a bag full of quail she'll plant on the back course) and her other judge. Senior braces can take half an hour to run. 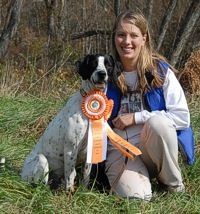 This Brittany and his handler are relaxing in the gallery area while they wait their turn. 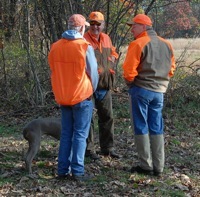 Two handlers and a between-braces gunner do the most important thing that happens at a hunt test: learn a few things from each other. 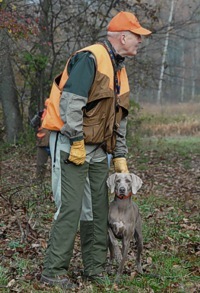 A liver German Shorthair doing what shorthairs do. A nice head-high, long-range point from the middle of the field. Diving into some scratchy cover as he starts a very busy run through the bird field in a Junior Hunt Test, Jerome's off and running. In junior tests, dogs don't have to be steady to the flush - and indeed, 'Romeo finds the quail kicked up by his handler to be irresistable. Perhaps not yet steady on the flush, but he retrieves, gently, right to hand. And another solid point on Bob White. More of a bird's-eye view. Jerome is a serious fellow when he's in the zone. A nice stack while Mom goes to the clubhouse for the ribbons. Two ribbons: one for the day's test qualification, and since it was his fourth, another for achieving his JH title. Riley cuts loose in the bird field. 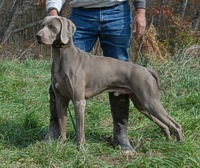 He's working on the last leg of his JH title, and knows there are birds for him to find. 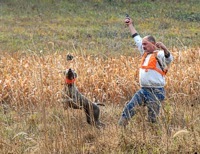 With Riley on point, his handler - blank gun in hand - approaches for the flush and cautions him to stay cool. 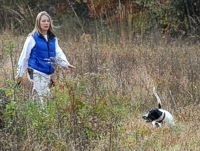 The quail's up, Riley's reacting from his point, and his handler is firing a simulated shotgun with her blank gun. Riley's qualified four times in a row, so he's got his JH title and a smile from his Mom. His achievement is all the sweeter when you take into account his circumstances: Riley was a rescue dog that's got himself a loving, permanent family who are making sure he gets to be a bird dog.